Starting any business will result in organizational expenses related to the formation of your business entity. Even default forms of business, organized properly, will incur costs when forming. Even the least formal business should at very least, open a bank account and apply for any/all necessary permits and licenses to operate. Forming a business entity with your state will result in filing fees, IRS form fees as well as your bank account and permits and/or licenses to operate your business. 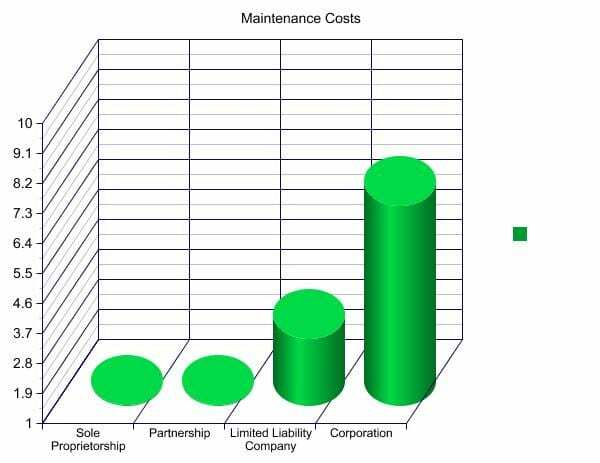 Depending on what type of entity you form, there will be additional costs associated with the organization and maintenance of the business entity. State filing fees are due when your articles are filed with the State Secretary's office. EIN Number and tax classifications will be accompanied by a fee with the IRS. 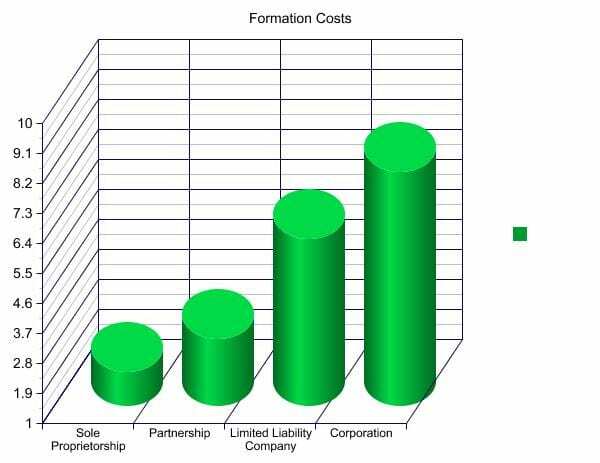 From the graph, you can see that the default forms of business, sole proprietorships and partnerships, come in with the lowest formation costs. It is a very minor investment to start conducting business as a default business type – even if all business formalities have been addressed, these business entities are not filed with any state office, which alleviates state fees. Corporations and LLC's will have to pay the state a filing fee, annual statement of information fee and agent of server process' annual fees, as well as any IRS filing fees. Business Checking Account: Every business should operate with it's own business checking account. This will result in nominal fees and an initial deposit with your financial institution to open a new account. Business Licenses / Permits: Compliance is critical and operating your business with the required business licenses and permits should be conducted. State Filing Fee: When filing with the state office as a registered business entity, a fee will be associated with the recording of your articles of incorporation or formation. Tax Form Filings: Getting your business an EIN Number or changing its tax classification will require IRS filing fees as a one-time processing charge for your tax form filing. Annual Report / Statement of Information: Prior to the anniversary of the incorporation or formation of your business entity, a state requirement is to provide a list of the business' officers, directors and shareholders (for corporations) or members and managers (for LLC's). This is a simple form accompanied by a nominal fee and some states have electronic filing. Registered Agent: Every registered business entity needs to have a designated registered agent, this is a publicly recorded physical business address – 1800Company.com offers FREE registered agent services with the formation of your new business. Annual Meeting Minutes / Corporate Records: Corporations are required by law to hold annual meetings of the board of directors and shareholders and meeting notes need to be taken in the form of minutes and stored with the corporate records.